The lure of the Toyota Prius and other hybrid cars helped drive healthy sales of electric and alternative-powered vehicles last year, according to new data that shows the hybrid market has grown by 960 percent since 2000. New hybrid vehicle registrations totaled 83,153 in 2004, an 81 percent increase over the year before, according to data released Monday by R.L. Polk & Co., a Southfield-based firm that collects and interprets automotive data. Even though hybrids still represent less than 1 percent of the 17 million new vehicles sold in 2004, major automakers are planning to introduce about a dozen new hybrids during the next three years. Lonnie Miller, director of analytical solutions for Polk, said federal and state tax credits for fuel-efficient vehicles have helped spur hybrid sales. More people also are buying into the idea that driving a hybrid is socially responsible. "What's different about this than other types of vehicles is that hybrids are about what people want to give back and what they want to feel they're doing with their vehicles," Miller said. Despite the arrival of Ford Motor Co.'s Ford Escape hybrid in showrooms last year, Japanese automakers continued to control the vast majority of the U.S. market, Polk said. Japanese brands accounted for more than 96 percent of the hybrid vehicles registered. Toyota Motor Corp., which was the first automaker to commercially mass-produce and sell hybrid cars, continues to dominate the market. The Toyota Prius, which went on sale in the United States in 2000, occupied 64 percent of the U.S. hybrid market last year, with 53,761 new Prius cars registered, Polk said. 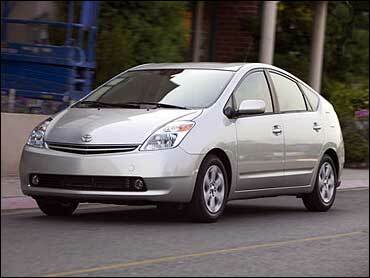 Toyota is on track to double Prius sales again this year. The company sold 22,880 Prius cars in the first three months of the year, more than double the number it sold in the first three months of 2004, according to Autodata Corp. Toyota has said it plans to produce 100,000 Prius cars for the North American market this year. The Honda Civic hybrid was second with 31 percent market share. Honda Motor Co. also sold several hundred Accord and Insight hybrids, which each commanded 1 percent of the market. Ford sold 2,566 Escape hybrid sport utility vehicles, or about 3 percent of the market, Polk said. Automakers are introducing hybrid versions of several models this year, including the Lexus RX400h, Mercury Mariner and Toyota Highlander SUVs. General Motors Corp. and DaimlerChrysler AG already sell hybrid pickups, but the system they use is less fuel efficient. Hybrid vehicles are powered by internal combustion engines but also are equipped with batteries that are recharged while driving and an electric motor to assist with power. They typically cost $3,000 to $4,000 more than traditional models. Miller said hybrids could make up 30 to 35 percent of the U.S. market by 2015 as long as automakers remain committed to producing them and market to people who are passionate about driving them. While some analysts believe there's a limit to the number of consumers who will pay more for a hybrid, Miller said the cost of hybrids eventually will come down. "Some people are thinking there's absolutely no reason that all vehicles shouldn't be hybrid. The technology is there," Miller said. Polk said California was once again the top state for growth in hybrid vehicle registrations. More than 25,000 new hybrids were registered in California, a 102 percent increase over 2003. Virginia, Washington, Florida and Maryland rounded out the top five states for hybrid registrations, the same as in 2003.